The Chemistry and Pharmacy collections are housed in the Science Library, all other science collections are housed in the J.D. Williams Library. The combined Chemistry and Pharmacy collections contain over 65,000 volumes and receive approximately 450 journals and standing order serials, including online subscriptions to Medline, International Pharmaceutical Abstracts, Scopus, and SciFinder Scholar. The Science Library space offers a comfortable quiet environment with wireless internet, PC’s, a scanner, printer, photocopier and assistive technology. A Science Library Floor Map showing available technology is available. Three study rooms are also available on a first come first served basis. Two librarians and one full-time staff are available to help users with library research and finding materials. Services available include reference, circulation, reserve, photocopy, and bibliographic instruction and assistance. 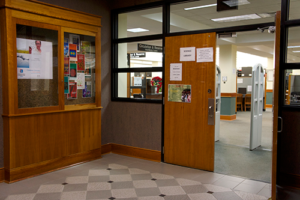 Tours of the library and library instruction to classes may be scheduled contacting us.